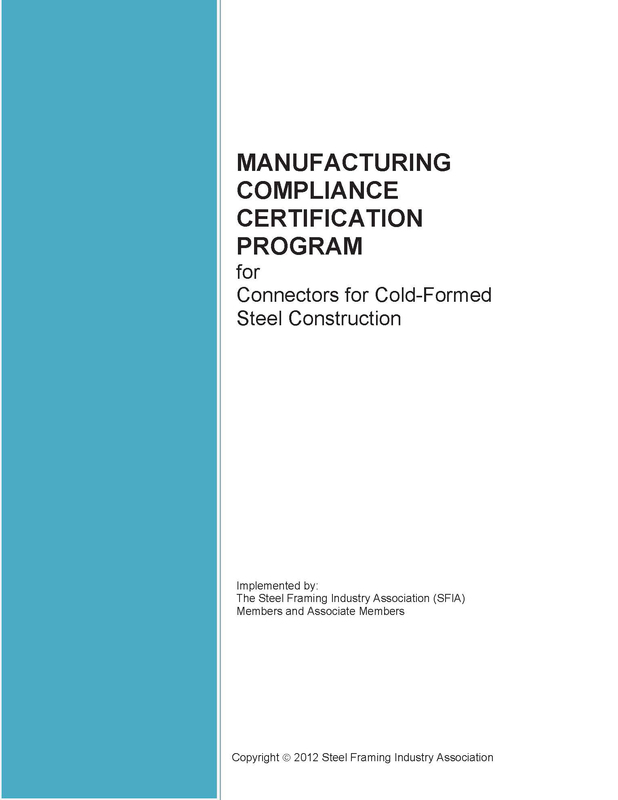 The SFIA Manufacturing Compliance Certification Program program for cold-formed steel connectors provides customers that purchase connectors with the SFIA-certified label that the product has been independently tested to ensure they consistently meet certain minimum manufacturing quality standards. In Cold-Formed Steel construction, connectors are galvanized steel straps, ties, or angles typically used to hold structural elements of a building together, such as connecting the top of a wall to the roof trusses or attaching walls to the foundation. Connectors are considered “structural elements” that play a crucial role in the design of modern buildings, and help ensure that buildings are safe even when subjected to high winds and seismic forces. Manufacturers that participate in the SFIA program, titled Manufacturing Compliance Certification Program, agree to comply with the program requirements that govern the materials used to produce the connectors, protection against corrosion, manufacturing tolerances, and marking requirements. A third-party administrator audits each manufacturing facility annually to ensure these standards are met. The SFIA Certification for Connectors was initiated in 2013, and we are proud to announce that ClarkDietrich Building Systems and Simpson Strong-Tie Company are the first to achieve recognition as Certified Manufacturers under this program.